Photo: In this photo released by the Emirates News Agency (WAM), damage is seen on the side of the M. Star oil supertanker as it arrives at Fujairah port in the United Arab Emirates Wednesday. 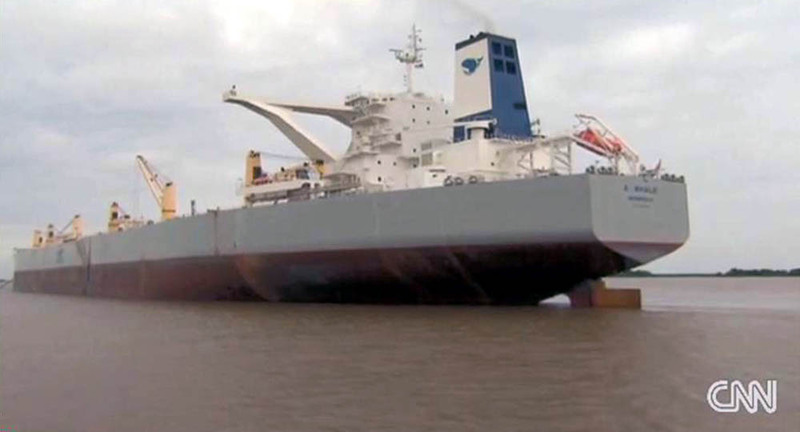 The Japanese supertanker M. STAR carrying 270,000 tons of oil was damaged by an explosion Wednesday, July 28, caused by a suspected attack in Omani territorial waters near the Strait of Hormuz, which passes Iran and Oman. One lifeboat was blown off the ship and a large dent made in its hull. A crew member was slightly injured, but there was no oil leak. But the most striking feature of the incident, noted by debkafile’s military and intelligence sources, is the unusual degree of assent between US Navy and Iranian officials that the damage to the supertanker was caused by an explosion by an unknown hand. “The fire which was triggered by an explosion on the deck of the vessel was contained with the help of the crew and regional forces,” Fars News Agency quoted head of marine department of southern Hormozgan Province, Ali Akbar Saffai, as saying, after two Iranian officials before him had attributed the blast to a low-magnitude earthquake. Clearly both Washington and Tehran were taken unawares by the first attack ever mounted on a commercial vessel in the Strait of Hormuz, the narrow transit channel for some 40 percent of the oil shipped worldwide and one of the most carefully secured waterways in the world. Both the US and Iran need time to find its cause and decide what to do. Meanwhile, this exceptional circumstance finds them of one mind on at least one issue, the incident must not be allowed to spiral out of control into a larger event. According to our sources in Washington and Tehran, while waiting for evidence, both speculate that the perpetrators may be either pirates in the pay of Al Qaeda in the Arabian Peninsula or even a rogue element in the Iranian Revolutionary Guards, which is bent on settling scores for the latest UN, US and European sanctions against their country. Tehran has repeatedly warned it will fight back if sanctions hurt its economy and energy supplies. The attack on the Japanese supertanker intensified Saudi and the Gulf emirates’ concerns over a possible threat to their oil exporting routes. Wednesday night, fearing an unidentified assailant may also go for their oil ports and shore installations, Persian Gulf navies, the Fifth Fleet Bahrain-based headquarters and the Iranian Revolutionary Guards naval installations at Bandar Abbas went on a high alert. Our military sources report some 100 warships of different navies are currently present in the Persian Gulf. 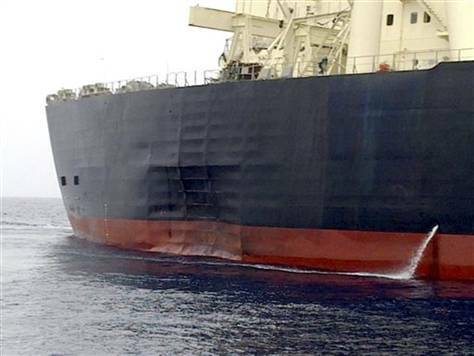 After the attack, the Japanese supertanker, which took on crude oil Tuesday at the United Arab Emirates port of Das Island, headed for Fujairah in the UAE to assess the damage. Straight after the first inspection, both American and Iranian naval experts no doubt received an interim diagnosis of what caused the explosion from their local agents. The forensic analysis of the means used to damage the M STAR would offer the first lead to the perpetrators, indicate whether it was caused by a missile, torpedo or some other means, and from what direction it was fired. 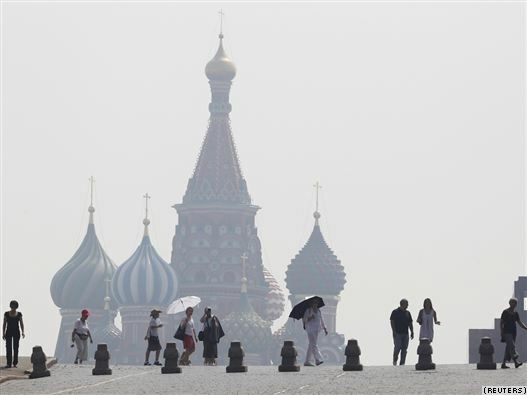 Photo: People walk along Red Square, with St. Basil’s Cathedral seen through heavy smog caused by peat fires in out-of-city forests, in Moscow, July 26, 2010. NOVO-OGARYOVO, Russia (Reuters) – A leading politician said hundreds of people could die as smog from peat fires blanketed a sweltering Moscow for a second day on Tuesday. Moscow region chief Boris Gromov asked Prime Minister Vladimir Putin to allocate 25 billion rubles ($827 million) to fight the fires smoldering in the forests around Moscow. Alexei Yablokov, a leading biologist who heads Russia’s Green Party, said air pollution caused by the smog’s high amount of carbon dioxide could kill hundreds more people than usual in the Moscow region. “There will be at least 100 additional deaths per day this time round,” Yablokov told Reuters, referring to the last such smog cloud in 2002 in which he calculated 600 people had died each week. The Moscow government agency overseeing air pollution, Mosekonomonitoring, said the levels of carbon monoxide in the air on Tuesday shot up by 20-30 percent more than normal levels. Russia’s senior public health official suggested on Tuesday employers free their staff while the thick smog and record-breaking heat in the Russian capital surged. 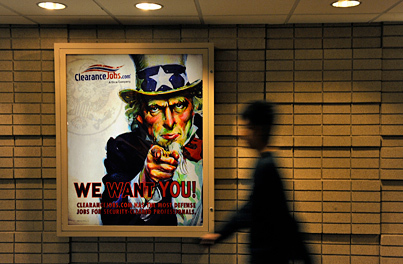 “Employers, if there is a possibility, could allow people to not come to work,” Gennady Onishchenko, head of Russia’s health protection agency, told Interfax news agency. Peat, used in the past to produce heat and electricity, smoulders deep underground in winters and summers. Gromov said the only solution to the fires was to pour water over deposits. “According to preliminary estimates, only in one district where fires are now most severe, over 4.5 billion roubles is needed. We have five such districts,” Gromov told Putin during an emergency video conference. 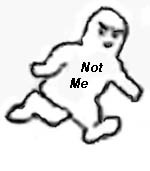 Putin said he would ask the emergency and economy ministries to examine the request. The emergencies ministry said that in the last 24 hours there had appeared 58 new fires in the Moscow region, 30 of them at peat deposits. Agricultural scientists at the Borlaug Global Rust Initiative (BGRI) and the International Center for Agricultural Research for the Dry Areas (ICARDA) have reported that a major outbreak of a virulent new strain of yellow (stripe) rust has been identified in prime Middle Eastern wheat growing regions. The outbreak has reached epidemic proportions in Syria’s major grain producing provinces bordering Turkey and Iraq, with significant national crop losses expected. Outbreaks have also been reported in central and southeastern Turkey, northern Iraq, north, west and southern Iran, and in Lebanon. Outside the Middle East, yellow rust outbreaks have also been identified in Morocco, Azerbaijan, and Uzbekistan this year. The current outbreak is primarily affecting soft bread wheat varieties, which form the backbone of the regions wheat crop. Hard wheat’s such as Durum are also grown in the region, but these varieties are a minority of total acreage. Scientists report that the new strain of yellow rust has plagued soft wheat crops that were previously resistant to the fungus owing to the incorporation of the gene Yr27. This implies that the majority of soft wheat grown in the region is under threat until newer resistant varieties are developed. The last major outbreak of yellow rust in the region was reported in the late 1980’s, resulting in a 21 percent reduction in regional wheat production. 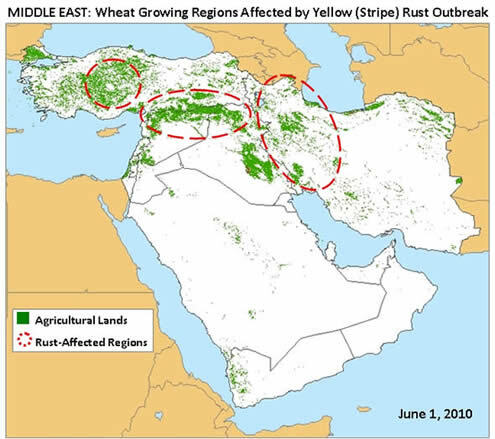 Prior to the announcement of the current rust epidemic, wheat production in the Middle East was expected to rebound from several years of drought to a level of 41.1 million tons (an increase of 12 percent). The generally favorable environmental conditions which prevailed during the current winter growing season which would normally create bumper crop production potential, including above normal rainfall, mild winter temperatures, and lush crop growth, also apparently contributed to enhancing the spread of yellow rust and the severity of infection this season. Ideal meteorological conditions encouraged rapid development of yellow rust infections, massive spore production, and a lengthy period of time to infect regional crops. Severe and persistent drought held southern Russia in its grip in June and July 2010. Low rainfall and hot temperatures damaged 32 percent of the country’s grain crops, said Russian Agriculture Minister, Yelena Skrynnik on July 23. This satellite vegetation index image, made from data collected by the Moderate Resolution Imaging Spectroradiometer (MODIS) on NASA’s Terra satellite, shows the damage done to plants throughout southern Russia. Largely as a result of the drought, the USDA expected Russia’s overall wheat crop to be 14 percent smaller than in 2009. Global warming? I don’t blame human beings for all the “heat” and “oceans rising” but I read about our planet’s environment from multiple sources and pray. After all, we have only one planet accessible right now. 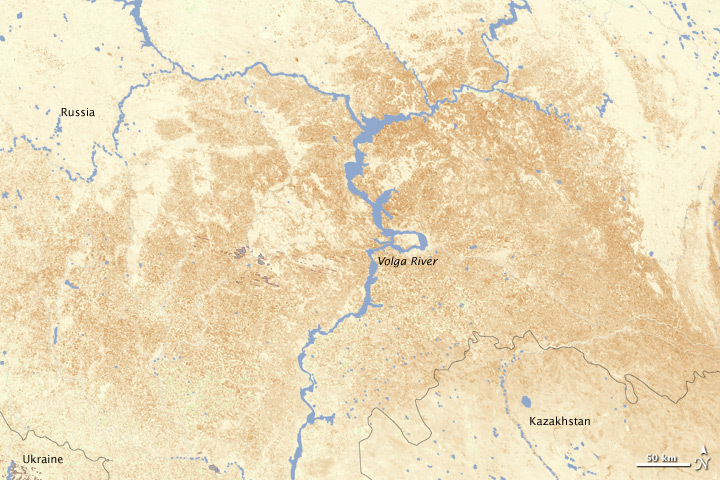 Drought and heat of 30-35C caused taiga forest fires in Yakutia (Siberia). 28 fires have been recently registered, 21 of them in Yakutia, the local Forest Service reports. In the Chukotka Autonomous region fires hit at least 8,000 ha of forest, destroying rain deer pasture. Some 60,000 ha of Taiga have been destroyed by fire since early summer. 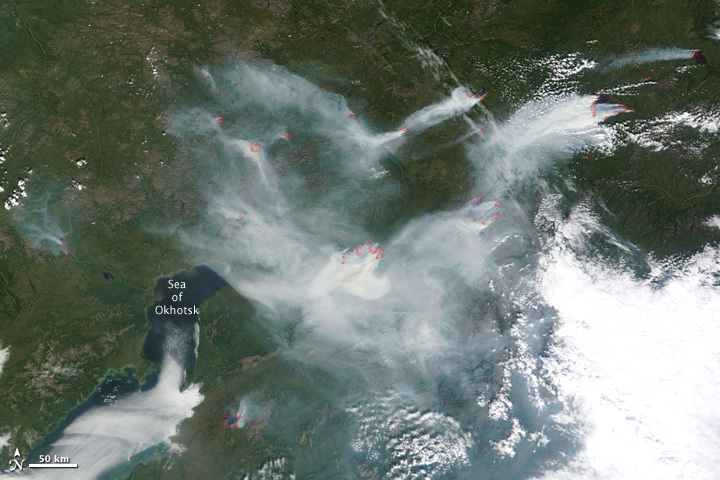 Numerous large forest fires were burning in Russia’s Far East on July 19, 2010, when the Moderate Resolution Imaging Spectroradiometer (MODIS) on NASA’s Terra satellite passed overhead and captured this photo-like image. Actively burning areas that MODIS detected are outlined in red, while thick smoke shrouds the forested landscape below. The body of water at lower left is a bay at the northeastern end of the Sea of Okhotsk. Lightning storms, combined with dry conditions, are causing a rash of forest fires in northern Manitoba. As of Friday, firefighters were dealing with 26 new forest fires in the northeast part of the province, and all were started by lightning, said Duane Feely of Manitoba Conservation. Fairbanks is smoky. Anchorage is smoky. To be in Alaska this early June is to see skies of haze, mixed with the scent of burning forests. Because of an unusually dry winter and spring, 293 wildfires already have burned some 463,000 acres according to the Alaska Interagency Coordination Center in Fairbanks. Alaska experienced unprecedented fire activity during May that was more characteristic of extreme July conditions, the center noted. Most of the wildfires are lightning-caused, and are located southeast and west of Fairbanks. Persistent heat and a lack of rain have been rampant in interior Alaska over the past two weeks. Greater Hinggan Mountains of northeast China’s Heilongjiang Province, July 2, 2010. More than 21,000 firemen, 10 helicopters and hundreds of bulldozers and fire engines have been putting out the lighting-triggered forest fires in northeast China. Fierce wildfires swept across Europe on Friday trapping hundreds of holidaymakers as firemen struggled to contain the flames that have killed at least seven people so far. 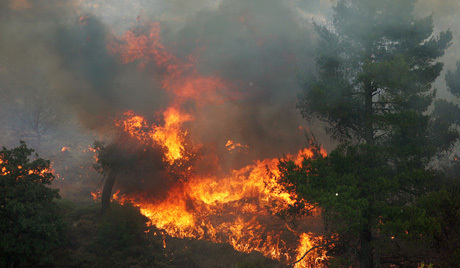 The fires were spreading rapidly on Friday night across Spain, France, Italy, Greece and Turkey in tinderbox conditions as Celsius temperatures hit the mid-forties in some Mediterranean areas and were expected to rise over the coming days, threatening further devastation. Light wildland fire activity continues throughout the country. Three new large fires were reported: one each in Alaska, Arizona and Idaho. Firefighters contained three large fires yesterday. Fifty-five large fires are being managed to achieve multiple objectives throughout the states. Uncontained large fires include only fires being managed under a full suppression strategy.